The Los Angeles Police Academy’s history in the Chavez Ravine area of Elysian Park goes back more than seventy-five years to when the Los Angeles Pistol Club was founded on more than twenty acres of leased city land. Today, that organization is the Los Angeles Police Revolver and Athletic Club. Now, the Club’s website reports it was founded in 1931. The Los Angeles Police Department gives 1925. So, like I said, more than seventy-five years ago. The Elysian Park shooting range served as the venue site for the 1932 Olympics revolver and pistol matches. Afterwards, the club acquired buildings and equipment from the U.S. Olympics Organizing Committee. The buildings had to be relocated from Olympic Village in Baldwin Hills. The city took over training duties from LAPRAAC in 1936, with the LAPD officially moving in and maintaining the site since (the club is still there). As for the city landmark, a year before the LAPD took over, the Parks Commission gave LAPRAAC the go-ahead to build an athletic center, including a rock garden, on the site. It wasn’t until early 1937 that the club hired landscape artist Francois Scotti to design the garden. He included four pools, stone seats, waterfalls, a modest amphitheater, and even a barbecue pit. 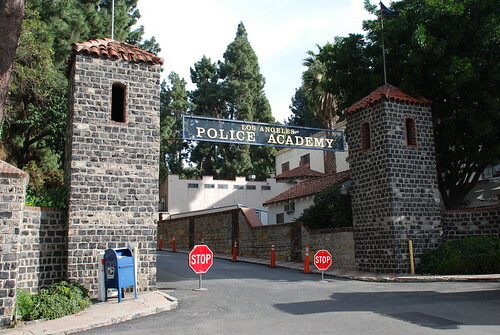 The Police Academy has been the site of many movie and teevee filmings. 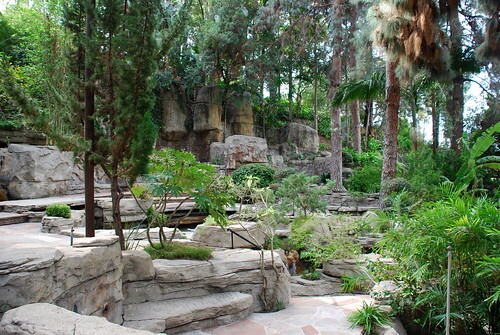 The Rock Garden, in particular, served as the setting for a couple of Tarzan movies (just look for the California pines in the deep, dark African jungles). If you would've visited the Rock Garden with me, not only would you be able to appreciate how beautiful the site is, but also you could tell me how high I'd leap out of my Buster Browns whenever there was a volley of gunfire from the adjacent shooting range. Funny stuff, there. 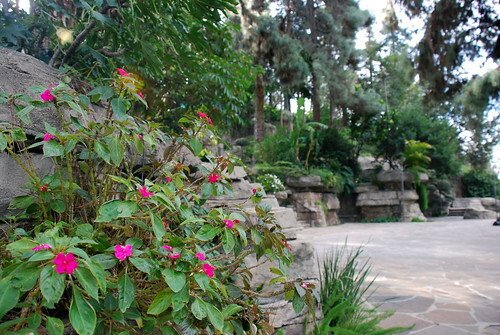 Wedding ceremonies may be held in the secluded rock garden of the Police Academy in Elysian Park which was built in 1935. 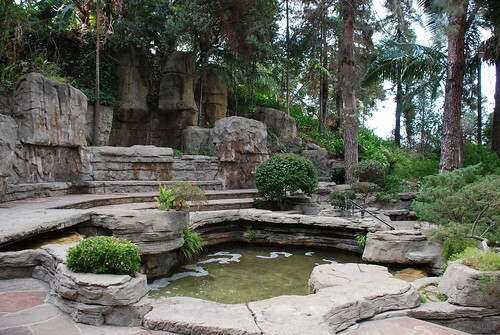 The gardens include four pools, several cascades, a small amphitheater for a band, and an outdoor dining area with a BBQ pit and large patio. 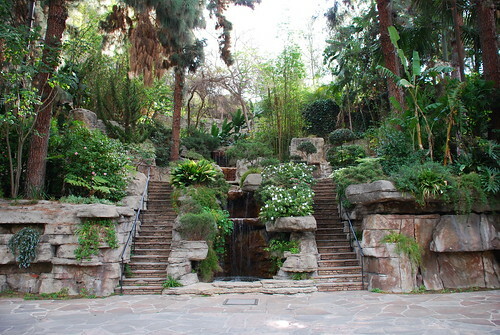 The garden was declared a Los Angeles Historic Cultural Monument in 1973. Some very good friends of mine married there in 1992. It is a lovely place. Not much for exploring. But if you need to be at the police academy for any reason, it's a nice walk with your Honey. :o) I love L.A.! I was at the Academy last year for the City of Angels ride, and had no clue this was there! Thank you!! 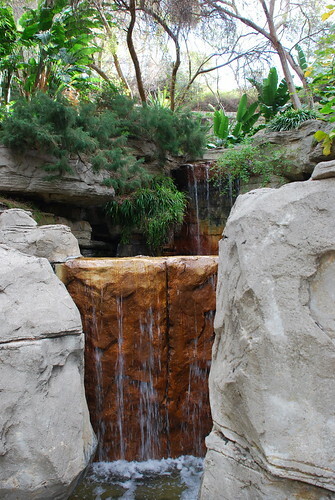 The pictures make the rock garden look so serene and beautiful. However, the sound of massive amounts of gunfire in the background of a happy wedding or other event would certainly put a damper on the joyous memory. Is it open to the public for visiting? Anonymous, they do not routinly have shooting at the ranges on the weekends, especially during something so special as a wedding. Why would you want people to believe there would be gunfire during their wedding. I've been to several events here including a wedding and it's an absolutely gorgeous location! They coordinate with the rest of the club during special events to insure that there's not gunfire or anything to disturb your event. Great staff, affordable prices, and a location with history you can't beat, what more could a bride ask for?! It was absolutely beautiful when I was there. Take care and God Bless. 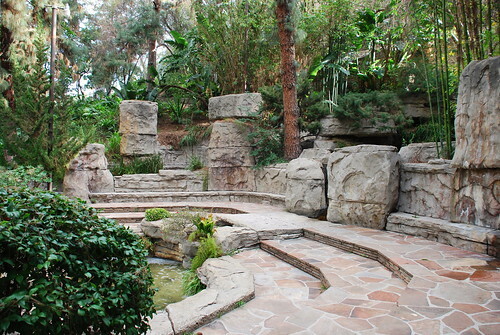 We were honored to have the Rock Garden as our wedding venue. The coordinator Colleen is the best and she was able make a girls dream for the perfect wedding come true. This place is so beautiful. Thank you so much Colleen for everything. This brings back a lot of memories! My dad was in the LAPD, and growing up in the '50s I remember coming here with my parents when they had parties and dances. 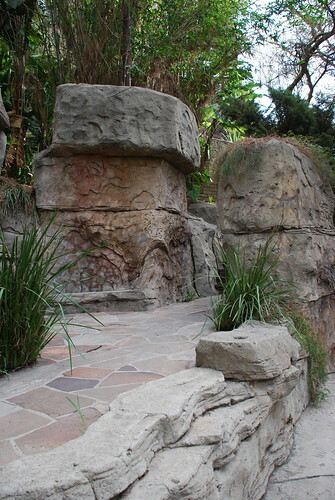 They grownups would turn the kids loose to play in the rock garden, then later they would show movies. This is where I first saw Disney's Pinocchio - terrifying for a little kid, especially the whale! Being in the LAPD in the 1950s, your dad must've collected some great noirish stories. Thanks, lindsaypinkham. The Old LAPD Academy has much more than the Rock Garden to recommend it. The Department recognized the need for a formal training facility in the '20's. The City Fathers (as usual) lacked the will to do the right thing so the cops did it for themselves! How? In brief, police men, trustees and the community did it. Look around. The retaining walls are old sidewalk pieces. The towers were once a cobble stone street. The list goes on and on. There is much to discover if one looks around. The story of the founding/building of the Academy would make a great movie. It is full of intrigue. I am surprised no one has done it! How do I know all this? I am second generation LAPD RETIRED. The family goes back to the late 30's in blue. In the early 90's, the C.O. of Training Div. appointed me as his "official" tour guide for visiting dignitaries. Does anyone have any information on what number to call to get info about having a wedding here? Thank you!